Title text: On January 26th, 2274 Mars days into the mission, NASA declared Spirit a 'stationary research station' expected to stay operational for several more months until the dust buildup on its solar panels forces a final shutdown. Anthropomorphism (or personification) is attribution of distinctly human characteristics to animals or non-living things. We make parallels between ourselves and objects, to the point where some people even jocularly worry about hurting the feelings of, say, an automobile. We call ships "she." We see human faces in objects like the arrangement of lights on the front of a car. The Spirit Mars rover, like many high-functioning robots in real life and fiction, shares many physical similarities with a human being or animal. It has a head, eyes, neck, body, legs, feet, arms, and a hand. And it strikingly resembles robots from fiction, such as Johnny 5 from Short Circuit, or WALL-E from the film with the same name. Thus, this comic explores what the Spirit rover's life would be like if it had a human personality. The rover was never intended to return to Earth, and lasted 5¼ active years on the Martian surface, far exceeding its expected mission duration of 90 Martian days. A sentient robot might assume that after its initially planned 90 Martian day mission was over, it'd get to return home. So, though this heartbreakingly did not happen, Spirit, possibly in a pun on its name, keeps its hopes alive while continously analyzing rock after rock for years. It would be cruelty of the absolute worst kind to create an intelligence with such feelings, and then abandon it on an uninhabited planet with no intention of ever bringing it home. So one is rather heartened that the Spirit rover is, in fact, just a programmed machine, and we explained to it very carefully that it was embarking on a one-way trip. It is worth pointing out that Opportunity, the rover's twin, has been even more wildly successful and was only shut down in February 2019 2111: Opportunity Rover. 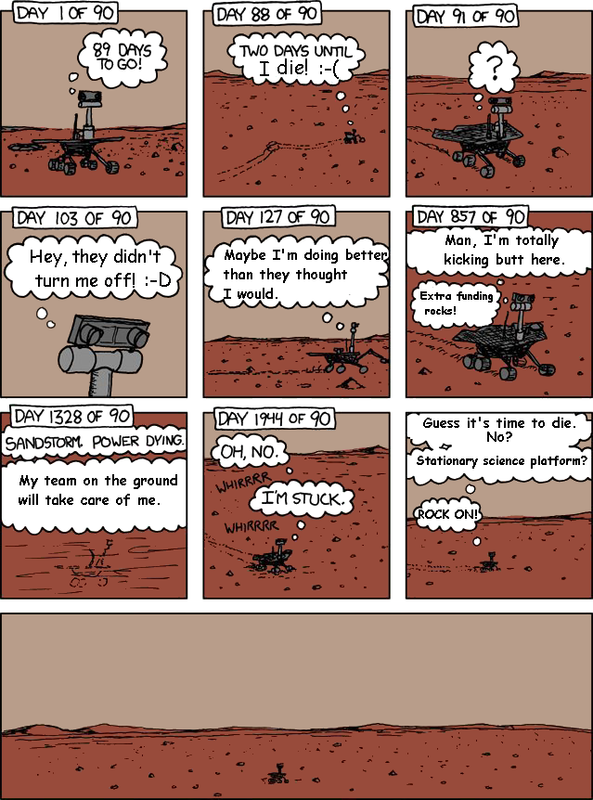 More than five years after this comic, when Opportunity had passed a Marathon distance, Randall celebrated this rover with the comic 1504: Opportunity. The title text has an apparent miscount: January 26, 2010, is more like sol (Martian day) 2156 by JPL's mission status site, not 2274. Final contact was on sol 2210 (March 22, 2010). Spirit (thinking): 89 days to go! Spirit (thinking): Two days until I go home! Spirit (thinking): Maybe I didn't do a good enough job. Spirit (thinking): Maybe if I do a good enough job, they'll let me come home. Spirit (thinking): I thought I analyzed that rock really well. Spirit (thinking): It's okay, I'll do the next one better. Spirit (thinking): Sandstorm. Power dying. Spirit (thinking): But a good rover would keep going. A good rover like they wanted. Spirit (thinking): Did I do a good job? Spirit (thinking): Do I get to come home? The strip had a strong emotional impact on the fans of the rover, who created a number of alternative versions and endings for it. In a blog post Randall mentioned a rewrites of this comic. Several others were made, including a silent one. some look forward to the day when Spirit is finally recovered (this one was seen at CERN). Others imagine a future when the rover is not alone any more. This page was last edited on 14 February 2019, at 23:15.